Selected Poems provides the opportunity for an introduction to, or a re-evaluation of, Hagger's work which, through its polished technique and sythensising sensibility, ought to mark him out as one of the UK's most distinguished poets. These poems serve as an introduction to Nicholas Hagger’s poetic works, which include nearly 1,500 poems, more than 300 classical odes, two poetic epics and verse plays. They are grouped in two parts which reflect the two aspects of the fundamental theme of world literature outlined in his A New Philosophy of Literature: ‘Quest for the One’ and ‘Follies and Vices’. They present a quest for Reality along with moments of heightened consciousness in which the universe is seen as a unity, and condemn social follies and over 220 vices in terms of an implied virtue. This selection of poems combines image and statement in the reconciling Universalist manner, and in different poems blends Romantic search and organic form with classical social attitudes, verbal precision and architectural structure. The poems cover five decades and include extracts from ‘The Silence’, which describes Freeman’s quest for Reality in Modernist style, ‘Archangel’ (a reflection on Communism following visits to China and the Soviet Union), poems written during a Dark Night of the Soul, glimpses of illumination and poems of social satire. There are also extracts from Hagger’s verse plays. As can be seen from his ‘A Metaphysical in Marvell’s Garden’ Hagger derives his inspiration from the 17th-century Metaphysical poets and seeks to unite the later Augustan and Romantic traditions. 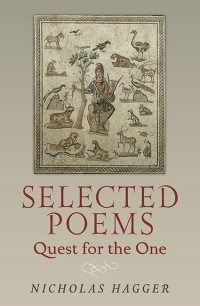 This selection offers a chance to reappraise a poet whose material, accomplished technique and reconciling sensibility places him in the forefront of poets writing today.